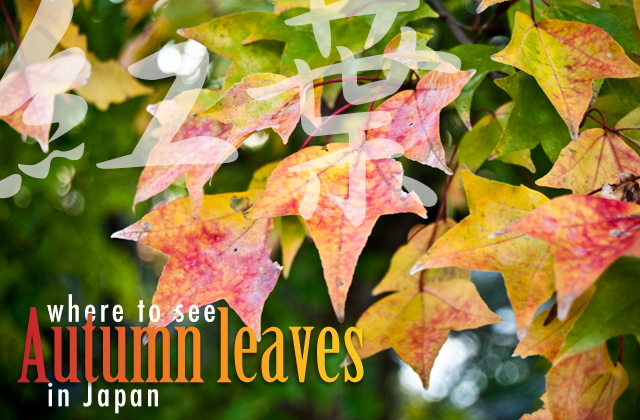 Now that it's October, we're inching closer to seeing the Autumn leaves in much of Japan -- although some places, like Hokkaido, are already boasting their colors. Lucky you folks in the North! 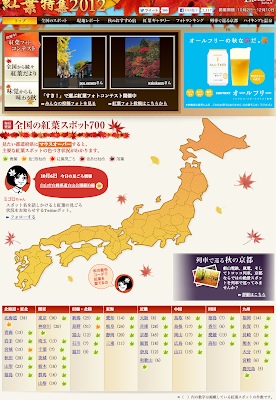 I've written previously about finding places to go to see and enjoy the lovely hues of orange, red and yellow here in Japan, this is a 2012 update. You may already be familiar with the popular tourist destinations for Fall colors (such as Kyoto), but if you're looking for some less crowded areas or some place nearby, you might find one of the following sites useful. 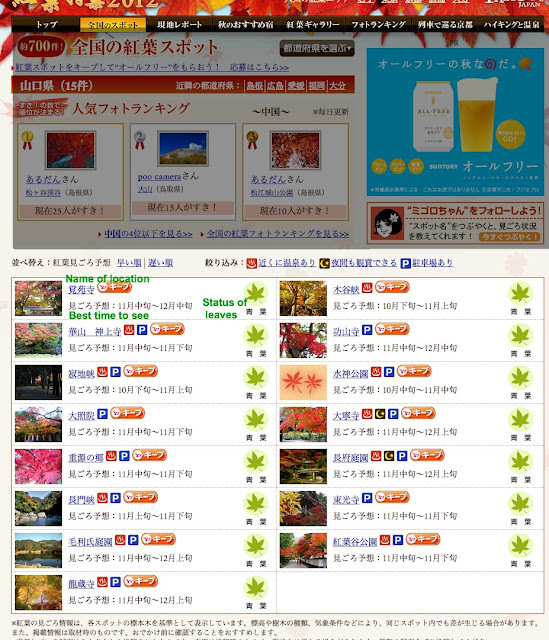 Each site offers a way to search locations all over Japan and find listings of good 紅葉 (こうよう, kouyou) spots. They are in Japanese only, which is why I'm also providing a tutorial below. 1. Go to this page, as shown below. 2. 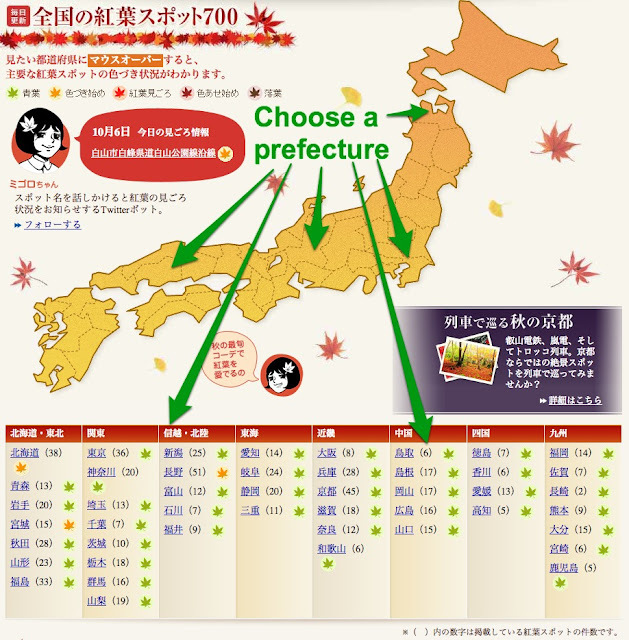 Click on a prefecture (whether your own or one you're visiting, etc.). For this example I'm going to click on Yamaguchi. 3. A list will show up with various locations (with the anticipated best time to view and current leaf status, indicated by the leaf color and changing icons) around the prefecture to view Fall foliage. Click on any of the names (blue links) for more detailed information. 4. 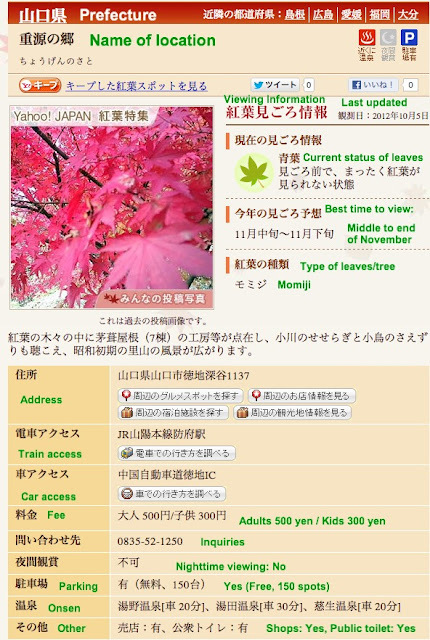 Once you've selected a name, the next page to show up will list detailed information including the current status of the leaves (again), expected best time to view (again), type of leaves/tree, address, access information, fee (if applicable), inquiry info, whether the place offers nighttime viewing, parking, nearby onsen info, and other info such as public toilet info or shops. And that's it! Though the other sites vary a bit in how you navigate them and some of the words they might use, it's still worth looking to see if they include any places the others don't. Where is your favorite Fall foliage spot in Japan?